Drain the coolant. Refer to Cooling System Draining and Filling. Remove the engine coolant temperature sensor. Remove the air conditioning condenser. Refer to Air Conditioning Condenser Replacement. Remove the engine coolant fan shroud. Refer to Engine Coolant Fan Shroud Replacement. Remove the radiator hoses. Refer to Radiator Inlet Hose Replacement and Radiator Outlet Hose Replacement. Remove the radiator upper bracket. 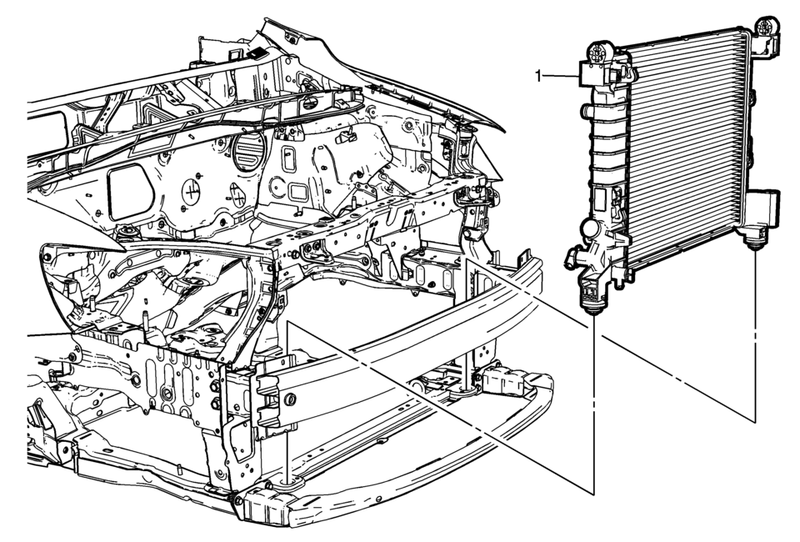 Refer to Radiator Upper Bracket Replacement. Tilt radiator forward to remove.